Construction Updated on March 5th, 2012. 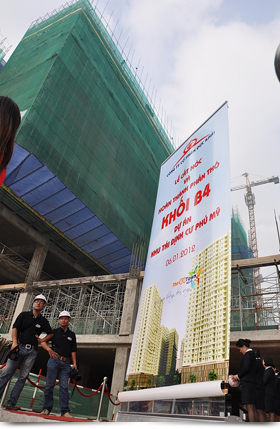 This morning, on January 6th, 2012, Duc Khai Corporation has celebrated The Topping out ceremony of block B4– Phu My resettlement project- The Era Town, marking the completion of the crude and shifting to the finishing phase after 12 months of construction. - The ceremony are honored with participation of representatives of the departments, committee, branches and the contractors, supervision, design consultants ... and other partners. - Phu My project is the modern style resettlement, serves the social welfare; includes 9 blocks of apartment from 24 to 30 floors and an- 8-floors of commercial center. In particular, the block B4 includes a basement and 24 floors. - The project is located on the connector of 15B street and Nguyen Luong Bang street, only 1km from there to Phu My Hung urban area and conveniently in moving to the city center through the roads: Nguyen Luong Bang, Nguyen Van Linh, Nguyen Huu Tho and Huynh Tan Phat. It is a peninsula in the heart of the city, with healthy living environment, airy space, adjacent to three sides of the river. - Applying of contemporary construction methods, using modern equipment with skillful engineers and workers, the project was completed on schedule with the best quality. - Upon completion, block B4 will provide 470 apartments, contribute to the house fund in resettling for major public projects in the city.